No matter how long you’ve playing fantasy football, there are always some lessons to learn. The game is evolving, and your fantasy strategies should follow suit. As we start our review of the 2018 season and begin to look ahead to 2019, it’s important to keep an open mind. Over the past two weeks I’ve offered up some of the lessons I’ve learned or ones which I was reminded of during the 2018 campaign at both quarterback and running back. Now let’s turn our attention to the wide receiver position. 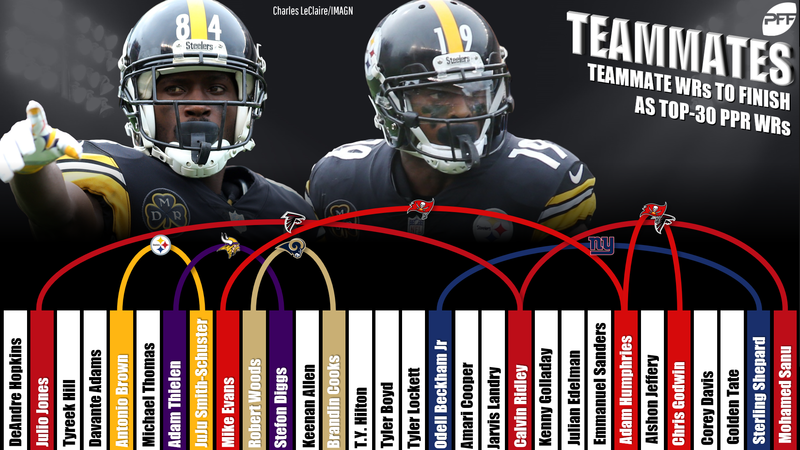 The Steelers had two wide receivers, Antonio Brown (WR5) and JuJu Smith-Schuster (WR8) finish inside the top 10 in PPR leagues in 2018. The duo combined for 51.2% of the target share in the Pittsburgh passing attack. Rams’ Robert Woods and Brandin Cooks finished 10th and 13th, respectively, in WR fantasy points this season also. Had he not missed eight games due to injury, their teammate Cooper Kupp likely would’ve easily wound up inside the top-25 among fantasy wideouts as well. Adam Thielen (WR7) and Stefon Diggs (WR11) of the Vikings both finished inside the top 12. In total, six teams had at least two wide receivers finish inside the top 30 in PPR points for the season. The Buccaneers and Falcons had three each — Mike Evans (WR9), Adam Humphries (WR24), and Chris Godwin (WR26) for Tampa Bay; Julio Jones (WR2), Calvin Ridley) (WR20), and Mohamed Sanu (WR30) for Atlanta — while the Giants (Odell Beckham Jr., Sterling Shepard) had two. The difference between what makes a player a WR1 and WR2 for fantasy purposes often revolves around consistency. After you get outside the top-20 the consistency drops off quickly. Identifying players trending up or falling off ahead of the curve is often critical. Even good players are subject to being streaky. Look no further tha n the 2018 season effort turned in by Thielen. The Viking started the year off with 100-plus yards in each of his first eight contests while finishing inside the top-10 at the position seven times. In his final eight outings he eclipsed the century mark and finished inside the top-20 at receiver once. Sometimes players get their production in chunks. Amari Cooper is a perfect example. He was traded mid-season; for the whole the year, he finished as WR18 with 215.5 PPR points. However, 101.3 of those points (47.0%) came in just three games. He averaged just 9.5 points per game in his other 12 contests. The amount of PPR points wide receivers combined to score in 2018 (18,040) was the second-most since the turn of the century, trailing only the production put up during 2016. 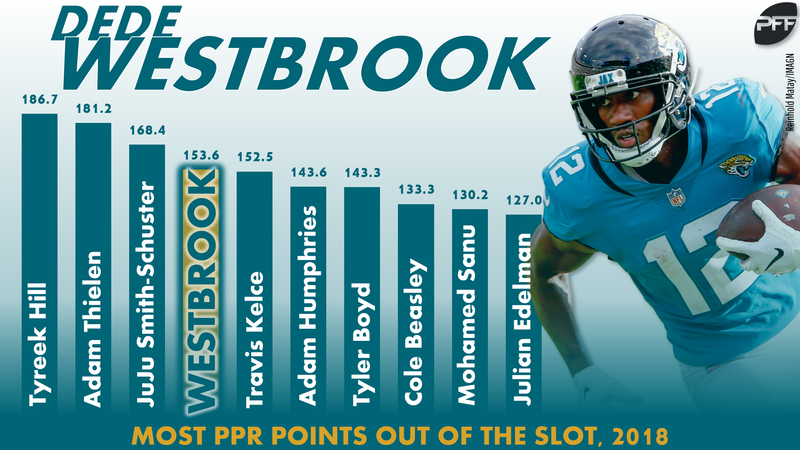 A ton of that production is coming out of the slot. It’s not just the Jarvis Landry types making fantasy noise out of the slot. This past season we saw 39 different wide receivers score 50-plus fantasy points from the slot. Tyreek Hill led all receivers with 858 yards and nine scores from the slot last season. Slot usage is becoming increasingly valuable data when attempting to project a player’s fantasy output and will continue to see growth. When necessary, you can always go to the waiver wire in a pinch in fantasy football. It’s usually much easier at wide receiver compared to the other skill positions. There were plenty of examples of this in 2018. Tyler Boyd emerged as a weekly starter in Cincinnati after putting up three straight 20-point efforts in Weeks 2-4 and stayed steady until he suffered a late-season injury. He finished with 76 catches for 1,028 yards and seven touchdowns in 14 games. Late in the year we saw guys like Robby Anderson, Dante Pettis, and Robert Foster all emerge as top-25 wide receivers over the last month or so of action. One of my favorite tools to use weekly to make both daily and season-long decisions is the PFF WR/CB matchup chart. It takes into account all projected coverage, not just primary coverage and easily identifies shadow situations that fantasy owners need to be aware of. It doesn’t keep me from rolling out my studs, but it is very handy when making some of those final decisions at the position. There’s no doubt in the long run it help give you advantage against opponents that are operating blindly in this regard. 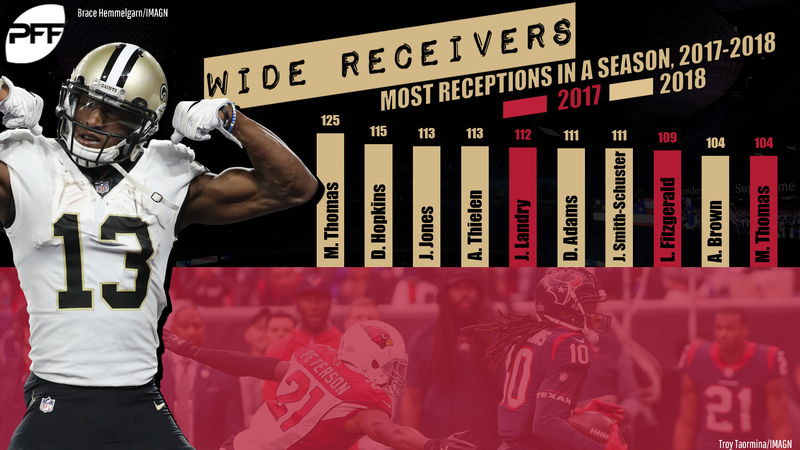 The 2018 season saw a record 532 touchdown receptions for wide receivers. Seven players caught 10 or more touchdowns. A year earlier only two receivers reached double-digit scores. In 2015 there were 10 wideouts that hit pay dirt 10-plus times. Seven wide receivers broke the 300-point barrier in PPR leagues in 2018 which was the most in a single season since 1995. A NFL-record six wide receivers finished a season with 110 or more receptions — Michael Thomas (125), DeAndre Hopkins (115), Julio Jones (115), Adam Thielen (113), Davante Adams (111), and JuJu Smith-Schuster (111). In each of the past two seasons Jarvis Landry was the only wide receiver to register that many catches. 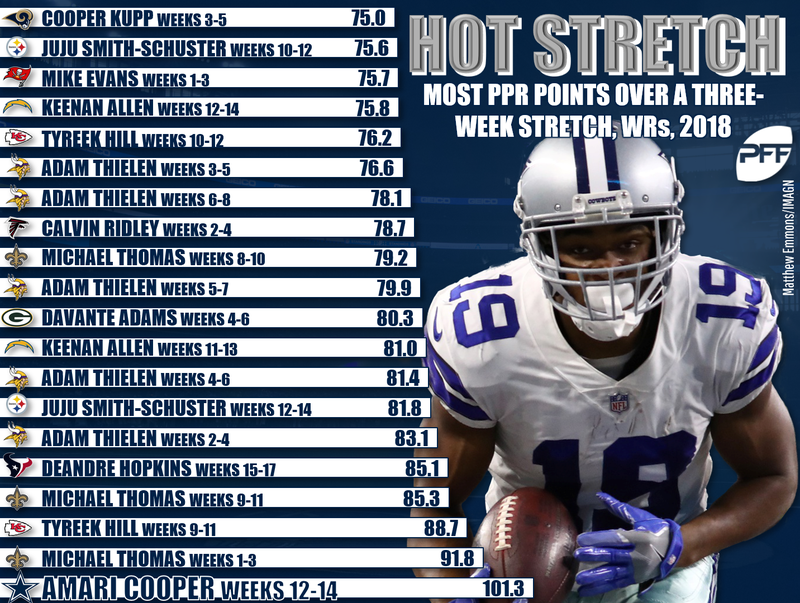 *Note: The next top three seasons at the position over the last five years for this list all were wide receivers from 2018: Davante Adams (327.6), Antonio Brown (323.7) and Michael Thomas (319.5). Clearly the wide receiver position is as productive and deep as it ever has been. There are some elite players at the top that can be counted on year after year. With so much of the attention in the first round going on running backs with fewer sure-fire players available there, you’re going to find great value throughout the draft at wide receiver. With all that in mind, it’s becoming increasingly difficult for me to justify spending a first-round pick on a wide receiver. There are a couple of players available who can return value there, but the difference at running back in Round 1 and Round 2 is much more drastic. Always work to keep improving your roster. Staying fluid at the position by always fine tuning the back end of it off the waiver wire is advised.